The study considered major activities to estimate the current market size for unmanned surface vehicles. Exhaustive secondary research was undertaken to collect information on the market, the peer market, and the parent market. The next step was to validate these findings, assumptions, and sizing with industry experts across the value chain through primary research. Both, top-down and bottom-up approaches were employed to estimate the complete market size. Thereafter market breakdown and data triangulation were used to estimate the market size of segments and subsegments. In the secondary research process, various secondary sources, such as Hoovers, Bloomberg, BusinessWeek, and Maritime Magazines have been referred to identify and collect information for this study. These secondary sources included annual reports, press releases & investor presentations of companies, white papers, certified publications, articles by recognized authors, gold standard & silver standard websites, food safety organizations, regulatory bodies, trade directories, and databases. After arriving at the overall market size using the market size estimation processes as explained above the market was split into several segments and subsegments. In order to complete the overall market engineering process and arrive at the exact statistics of each market segment and subsegment, the data triangulation and market breakdown procedures were employed, wherever applicable. The data was triangulated by studying various factors and trends from both, the demand and supply sides, in the unmanned maritime vehicle industry. ASV Global (UK), Teledyne Technologies (US), Textron Inc. (US), ECA Group (France), Israel Aerospace Industries (Israel), Atlas Elektronik (Germany), SeaRobotics (US), Maritime Robotics (Norway), Elbit Systems (Israel), Rafael Advanced Defense Systems (Israel), 5G International (US), and Liquid Robotics (US), among others. This research report categorizes the unmanned surface vehicle market based on application, system, mode of operation, type, endurance, hull type, size, and region. The unmanned surface vehicle market is estimated to be USD 534 million in 2018 and is projected to reach USD 1,020 million by 2023, at a CAGR of 13.8% from 2018 to 2023. Increase in demand for ISR, water quality monitoring, maritime security and threats, and the need for ocean data and mapping are the major factors that are expected to drive the unmanned surface vehicle market during the forecast period. The demand for unmanned surface vehicles is leading to the increasing interest of various manufacturers and their inclination towards investing in the unmanned surface vehicle market. Government organizations and private agencies have been investing significantly in the manufacture and development of advanced and efficient unmanned surface vehicles. On the basis of application, the given market has been segmented into defense and commercial. The defense segment is projected to grow at a significant CAGR during the forecast period, because unmanned surface vehicles offer greater capacity compared to traditional equivalent systems and can be equipped with stabilized weapon systems and electro optical tracking systems. This is expected to help militaries monitor also during the night using infrared vision. Based on size, the unmanned surface vehicle market has been segmented into small, medium, large, and extra large. The growth of the large segment can be attributed to the high-value contracts awarded to manufacturers of unmanned surface vehicles for the development of large unmanned surface vehicles, which are majorly used in defense applications, such as ISR activities, combat operations, cargo & resupply, etc. Based on mode of operation, the unmanned surface vehicle market has been segmented into remotely operated surface vehicle and autonomous surface vehicle. The growth of autonomous surface vehicle segment can be attributed to the increasing use of autonomous surface vehicles in defense and commercial applications, as these vehicles are able to conduct any commercial or military operations on their own without any human intervention. Changes in the surroundings of these vehicles are sensed by onboard sensing devices, which information is then electronically transmitted to the remotely located human operators. The European region is expected to exhibit the highest growth rate in the unmanned surface vehicle market, and is projected to grow at the highest CAGR during the forecast period. This growth is due to the demand for unmanned surface vehicles by navies for ISR activities and oceanographic studies, along with the presence of key manufacturers, such as the ECA Group (France), ASV (UK), and Atlas Elektronik (Germany) are in the region. Atlas Elektronik accounts for the largest share with reference to the manufacture of unmanned surface vehicles in the European region. The major players in the unmanned surface vehicle market include ASV Global (UK), Teledyne Technologies (US), Textron Inc. (US), ECA Group (France), Israel Aerospace Industries (Israel), Atlas Elektronik (Germany), SeaRobotics (US), Maritime Robotics (Norway), Elbit Systems (Israel), Rafael Advanced Defense Systems (Israel), 5G International (US), and Liquid Robotics (US), among others. ASV Global (now L3 ASV) is one of the key market players engaged in forming strategic partnerships and agreements so as to increase the adoption of USVs for commercial and defense applications by surveyors, scientific researchers, and defense organizations. In July 2018, ASV Global entered into a partnership with Sonardyne International Ltd., the National Oceanography Centre (NOC), and SeeByte to deliver a long endurance, multi-vehicle, autonomous survey solution. In May 2018, Teledyne Marine and Research Products Development Company (RPDC) signed an agreement to collaborate on global commercialization of new technologies developed within Saudi Arabia. In January 2018, Textron Systems signed a Cooperative Research and Development Agreement (CRADA) with Naval Sea Systems Command (NAVSEA). 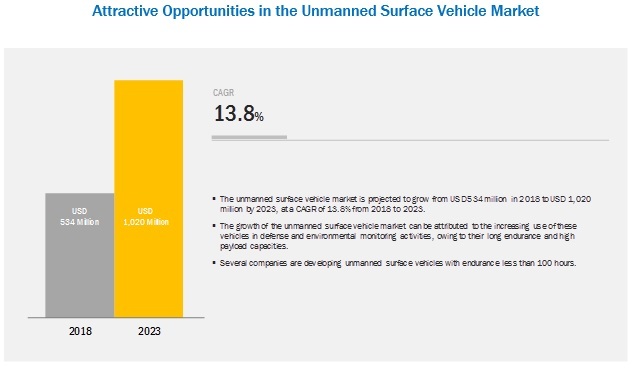 How will the drivers, challenges, and future opportunities for the unmanned surface vehicle market affect its dynamics and the subsequent market analysis of the associated trends? What are the key sustainability strategies adopted by leading players operating in the unmanned surface vehicle market? What are the new emerging technologies and use cases disrupting the industry? Which are the new customer and market segments to invest in, globally? When are the high growth niche segments expected to impact in changing the revenue mix of companies? Why are the interconnected neural network markets game changers for unmanned systems or autonomous suppliers/vendors? Who are the key players and innovators in the partnership ecosystem? How is the competitive landscape changing in the client ecosystem and impacting their revenue shares? 8.2.1 Enhanced Operational Efficiency of Usvs Generate Extensive Growth Opportunities for Usv Manufactures. 13.2.1 The Adoption of Kayaks is More Than Other Usvs Due to Their Convenient Mounting and Loading Capabilities. 14.3.1.1 China is Also Ahead Higher Adopting and Deploying Unmanned Systems Such as Unmanned Surface Vehicles.